On a spring morning in 1998 with the Photorefractive group at ESPCI. 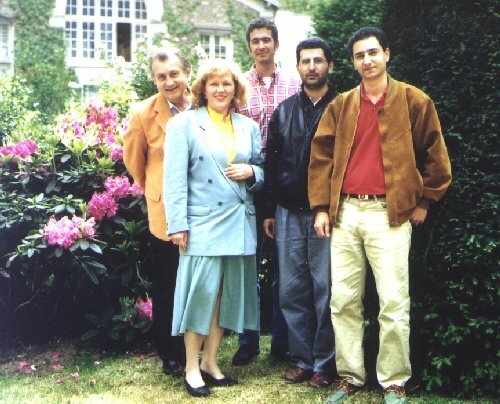 From left to right : Bernard Briat, Ludmila Rakitina, François Ramaz, Hicham Bou Rjeily and Bouazza Farid. The photorefractive effect is a non linear phenomenon which has been known for over thirty years. It consists in a spatial variation of the index of refraction of a material illuminated with a spatially non uniform light distribution. First considered as a drawback because of self diffraction ("beam fanning"), it has later on retrieved a gain of interest because of its many potential applications in correlation with the development of Coherent Optics, Holography or Signal Processing. The main applications are optical memories, forms recognition, fibers interconnections, optical aberrations treatment (optical phase conjugation), and real time holography. The main feature originates from the possibility to write phase gratings inside the medium. Another attractive property lies on the fact that this non linear behaviour requires low light intensity (a few mWatt/cm²), a rather unusual property. Photorefractivity implies photoconductivity (charge transfer absorption bands) in the spectral range of interest and a non-centrosymmetric structure for the material to demonstrate the linear electrooptic (Pockels) effect. For example, light is able to ionize an electron from the defect to put it into the conduction band of the crystal. Once in this state, it can recombine on the impurity, or, due to its mobility it can move to the dark areas and be efficiently captured on a trapping level. The same phenomena of course exist with holes via the valence band. It is therefore possible to develop a space-charge field within the crystal under light action. This leads to a modulation of the refractive index via the electrooptic mechanism. The effect can be magnified with the help of an electric field. Illumination may induce also a modification of the absorption spectrum (photochromism) due to the change in the number or charge of intrinsic or extrinsic defects. This implies that the trapping level is different from the original one. The time scale of all these microscopic reactions depends on many parameters such as temperature or light intensity. Since 1991, we have conducted a rather systematic spectroscopic study of a number of undoped and/or doped oxides (wide gap) and II-VI semiconductor bulk materials. 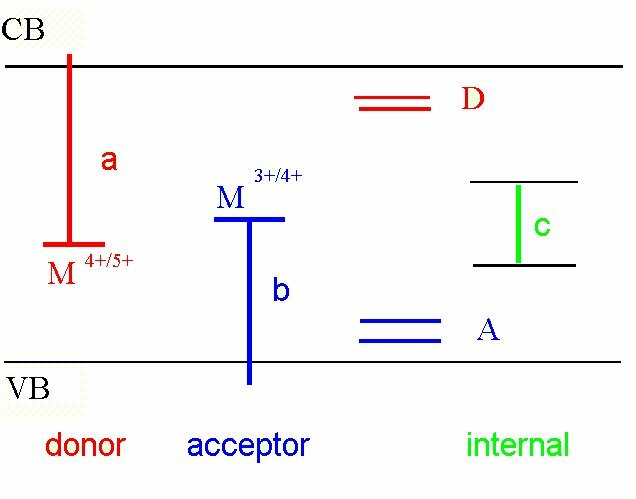 Donor and acceptor states are present in the forbidden band, due to the existence of intrinsic (non-stoechiometry) or extrinsic (intentional doping) defects. One necessary condition for photorefractivity to occur is that at least one defect can exist under two different charge states, light being used to recharge electrons or holes on the associated level. Our current methods of investigation are magnetic circular dichroism (MCD) and optical absorption (OA), as well as their variation under a secondary illumination (Photo-absorption and Photo-MCD). MCD is also being used to detect electron paramagnetic resonance optically (ODMR). Photorefractive gain measurements (Ar*, Kr*, He-Ne and Nd:YAG lasers) have also been undertaken in 1997. Our research was conducted in close collaboration with many colleagues (in France and abroad) in the field of solid state chemistry (crystal growth) as well as coherent optics. Our own contribution was mainly directed towards a microscopic characterization (nature, position, charge states) of the levels and of the associated charge transfer processes. In addition, photorefractive gain measurements have been undertaken in 1998 at the laboratory. MCD spectra in the near IR (down to 6000 cm-1) have been especially useful to figure out the charge of transition metal ions via the study of their well-documented crystal field transitions. Schematic diagram in the case where one ionic species M4+ can donate an electron to the conduction band (a) or receive an electron from the valence band (b). The occupation of the red and blue level will depend upon the position of the Fermi level, i.e., upon the respective number of additional shallow donors (D) or acceptors. The three ionic species may also show internal (d ® d*) transitions (c). Most of our studies have dealt with bismuth sillenites Bi12MO20 (BSO, BGO and BTO for M = Si, Ge, Ti) and Cd1-xZnxTe:V. The former are attractive since they are sensitive and relatively fast. The latter can be used in the near IR at eye-safe wavelengths (1.55 mm). Research has also been conducted on doped (V, Cr, Mn, Fe, Co) eulytites Bi4Ge3O12 (photorefractive in the near UV and scintillator) and LiNbO3 : Ru. Quite interestingly, sillenites and eulytites have a very close structure. Bismuth sits at a pseudo-octahedral site while, e.g., germanium has a tetrahedral oxygen environment. In the case of undoped BMO, a fraction of the Bi atoms sits at the M site and induce the presence of a [BiMO4]-/0 level (semiconductor notation) in the forbidden band. The population of this level depends strongly upon the optical and thermal history of the samples. Under the action of blue light, [BiMO4]- (diamagnetic) is transformed into [BiMO4]0 (paramagnetic) and the electron is trapped into a shallow donor level, presumably an oxygen vacancy. MCD and ODMR have clearly demonstrated that the hole left behind is delocalized onto the oxygens surrounding M. Similar types of processes occur when sillenites are doped with non magnetic donors (As, P) or acceptors (Al, Ga). Near band gap illumination results in the creation of paramagnetic objects of the type AsM5+ + e or AlM3+ + h (ionic notation). Transition metal ions of the iron group (V, Cr, Mn, Fe, Co, Ni and Cu) were shown to substitute for M in majority. In these materials, an alternative photoionization process occurs with light in the red-green part of the spectrum. One ionic species (e.g., Mn5+) is reduced by an electron from the valence band while the resulting hole is trapped by [BiMO4]-. Preliminary results have also been obtained for BSO doped with ions of the platinum group (Ru, Os). Vanadium doping of CdTe induces the presence of a deep donor level denoted V0/+ by solid state physicists and V2+/3+ by chemists and spectroscopists. A comparative study of twelve Cd1-xZnxTe:V samples allowed us to identify the spectral features characteristic of both V2+ and V3+ ions at the Cd site. Secondary illuminations enabled the observation of the V3+ photoneutralization at 1.55 micron and the V2+ photoionization at 1.06 micron. The V2+/3+ donor level was located at roughly 0.9 eV under the conduction band. It was established to be the main level involved in the photorefractive effect. By Photo-MCD, we determined for the first time the ratio of V2+ and V3+ concentrations in all the samples. This original technique combined with electron paramagnetic resonance, made it possible to determine [V2+] and [V3+]. Germanium doping brings also a semi-insulating character into CdTe. Our Ukrainian colleagues have demonstrated one of the largests photorefractive gains at 1060 nm in the absence of an electric field. We have observed considerable modifications of the absorption spectrum of such materials under a secondary illumination. The GeCd+/0 level has been localized at 0.95 eV below the conduction band. A second level has been observed via MCD and ODMR but it is not yet fully characterized. Progress is expected from a comparative study of samples annealed under different conditions. Optical Materials, 4, 197 (1995). Semiconductor Science and Technology, 10, 1629 (1995). J. Phys. : Condensed Matter, 7, 4115 (1995). IP95/04 - B. BRIAT, A. HAMRI, N.V. ROMANOV, F. RAMAZ, J.C. LAUNAY, O. THIEMAN AND H.J. REYHER. J. Phys. : Condensed Matter, 7, 6951-6959 (1995). IP95/05 - H.J. VON BARDELEBEN, C. MIESNER, J. MONGE, B. BRIAT, J.C. LAUNAY AND X. LAUNAY. Semiconductor Science and Technology, 11, 58-62 (1995). IP96/01 - L.A. DE MONTMORILLON, P. DELHAYE, G. ROOSEN, H. BOU RJEILY, F. RAMAZ, B. BRIAT, J.G. GIES, J.P. ZIELINGER, M. TAPIERO, H.J. VON BARDELEBEN, T. ARNOUX AND J.C. LAUNAY. J. Opt. Soc. Am. B13, 2341-2351 (1996). SPIE, 3178 , 160-168 (1997). J. Opt. Soc. Am. B, 15, 2147-2153 (1998). « Characterisation of charge transfer bands in photorefractive germanium-doped CdTe ». Optics Communications, 156, 337-340 (1998). J. Cryst. Growth, 197, 724-728, 1999. XII Conference on Solid State Crystals Materials Science and Applications, October 7-11, 1996, Zakopane (Pologne). SPIE Proceedings, 3178, 169-172, 1997. IA97/02 - M.T. BOROWIEC, M. ZALESKI, H. BOU RJEILY, A. HAMRI, B. BRIAT, A. MAJCHROWSKI, H. SZYMCZAK AND J. ZMIJA. XII Conference on Solid State Crystals Materials Science and Applications, October 7-11, 1996, Zakopane (Pologne). SPIE Proceedings, 3178, 184-186, 1997. Proceedings of the International Conference on Defects in Insulating Materials (EURODIM 98), Keele, U.K., July 6-11, 1998. Proceedings ICPS�98, Anvers, Belgique, 7-11 Septembre 1998. Topical Meeting on Photorefractive Materials, Effects and Devices, Aspen Lodge, Colorado, USA, 11-14 Juin 1995. Matériaux pour l�optique non-linéaire, Val Thorens, France, 14-18 Janvier 1996. Réunion du GDR II-VI, Autrans, France, 26-29 Mars 1996. ICDIM 96. Thirteenth International Conference on Defects in Insulating Materials, Winston-Salem, North Carolina, USA, 15-19 Juillet 1996. Journées CHIMIE DU SOLIDE, Paris, 4-6 Septembre 1996. Workshop of the Oxide Crystals Network of the European Science Foundation, Balatonfüred, Hongrie, 25-28 Septembre 1996. Physique en herbe, Caen, France, 30 Juin - 4 Juillet 1997. Réunion du GDR « Matériaux pour l�Optique non-linéaire », Bombannes, France, 24-26 Septembre 1997.
International Conference on Defects in Insulating Materials (EURODIM 98), Keele, U.K., July 6-11, 1998.
International Conference on Defects in Insulating Materials (EURODIM 98), Keele, U.K; July 6-11, 1998. CLEO/EUROPE-EQEC�98, Glasgow, Scotland, 13-18 Septembre 1998.